Lively Run Dairy owners Steve and Susanne Messmer recently took a winter trip to Susanne’s home country of Germany. Susanne was born and raised in the beautiful region of “Pfaltz,” which is located in the state of Rhineland Pfaltz in South West Germany. 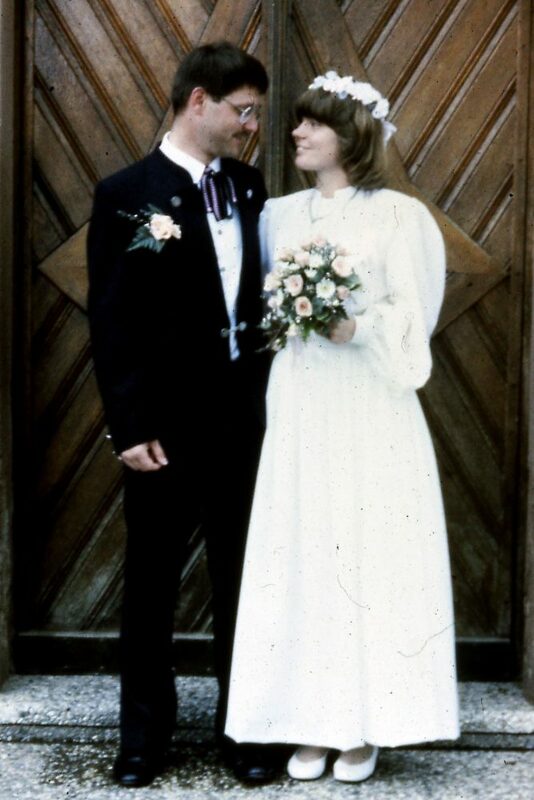 Susanne and Steve met and married in Germany while Steve was stationed there for military service. Steve eventually left active duty military service and remained in Germany, employed as a civil engineer. Soon they were happy parents of two sons, Pete and Dave, both born in Germany. In the early 1990’s they relocated their family from Germany to the United States. During a recent trip to Germany, they visited towns back in Susanne’s homeland of the Pfalz and explored some new locations. One of their favorite towns they encountered on their recent trip is the small town of Lambrecht , which is nestled in a narrow valley of the Pfaelzer Wald. 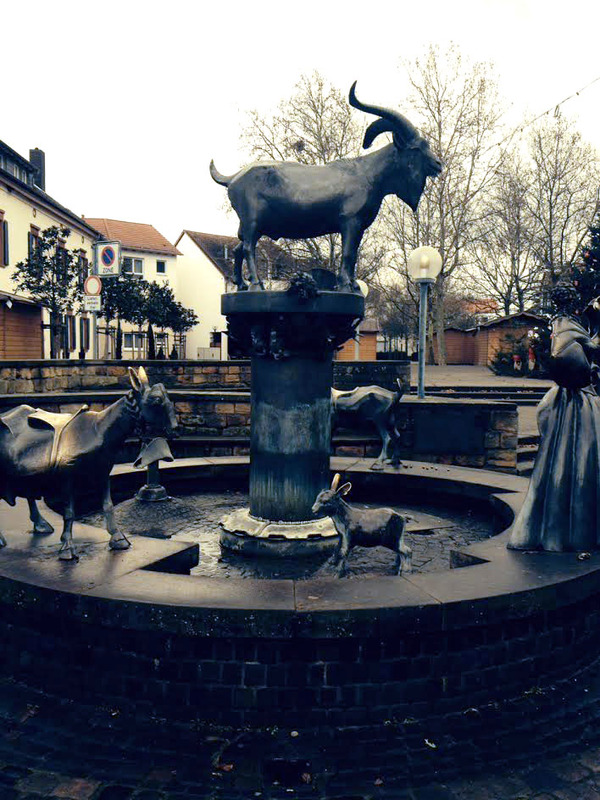 While they were exploring the center of the town, they came upon a small town square with a fountain in the middle containing a sculpture of a “Geissbock” (a goat buck with a nice set of horns). On the back end of the buck it showed, in great realistic detail, that he was well endowed, symbolic of the breed’s secure future. Being the goat lovers that they are, Susanne and Steve were quite amused by the fountain. The next day they travelled to the small, picturesque town of Deidesheim, which is situated along the “Deutsche Weinstrasse” (German winetrail), approximately 10 miles northeast of Lambrecht. 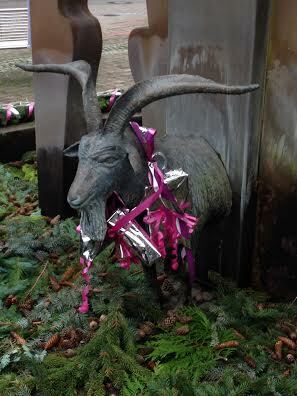 Here, they found another fountain “coincidentally” resembling the very same “Geissbock” they found in Lembrecht. The fountain was decorated other playful elements. During the Middle Ages, Lambrecht’s farmers used to keep goats in its surrounding forests, which have a terrain of steep hills and overgrown woods. Goats are very well suited for this landscape, as they are excellent climbers and fastidious browsers. Their ability to eat anything and everything, whether it is grass, saplings, brush, or weeds, actually helps to maintain a healthy woodland. Goats are historically and presently known for various weeding projects such as the Restoration of the Murrysville Tree Sign. Problematically, the woodlands located around Lambrecht, where farmers grazed their goats, belonged to the much wealthier town of Deidesheim. In 1404 Lembrecht offered a peace offering to Deidesheim that required the annual payment of a “gut gebeutelter” (well “hung” buck) to the town of Deidesheim. Since then, the buck has had to be delivered personally by the youngest married couple of Lambrecht yearly, on the Tuesday after Pentecost. In exchange, the couple receives a “kasebrot” (a piece of bread with cheese and a good “swallow” of the famous Deidesheim wine). After this, the buck is auctioned off by Deidesheim and the money pays for the grazing rights of Lambrecht. The tradition has continued on to the present day and is a fun, historical celebration for the two towns. Lively Run Dairy plans to hold an annual event on October 4th of 2014 that resembles the Lambrecht Goat Peace Offering to Deidesheim to educate the Finger Lakes Community about the German tradition. The event will be a great family cultural learning experience, with delicious food and fun entertainment! Stay tuned for more details about the upcoming event.